Joseph Rodota is a writer and consultant who has worked at the highest levels of politics in Washington, D.C., and California. He worked in the Reagan White House and as a top aide to California Governors Pete Wilson and Arnold Schwarzenegger, and has written for the New York Times, Los Angeles Times, Huffington Post and other outlets. He lives in Sacramento, California, where his play Chessman, about the final days of the "Red Light Bandit" Caryl Chessman, premiered at the B Street Theatre. “Watergate is having a moment,” writes Washington Post columnist Philip Bump. Mentions on cable news and searches on the Internet are at the highest level in a decade. Slate’s Watergate podcast “Slow Burn” was a smash hit. Nixon’s former counsel John Dean has tripled his Twitter following. The Watergate boom dates from May 2017, Bump writes, when President Trump fired FBI director James B. Comey. It’s hard to believe now that the Watergate was once generally known as a luxurious, private address in the nation’s capital. A sophisticated security system recorded the comings and goings of members of Congress, cabinet secretaries, White House aides, journalists, judges and diplomats. 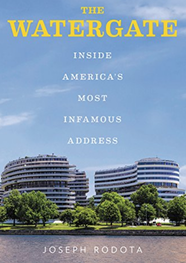 Owners of Watergate apartments, from massive penthouses with Potomac River views to modest one-bedrooms overlooking the Howard Johnson Motor Lodge, had something in common: a desire to be close to the center of power in the capital city of the most powerful nation on earth. On January 20, 1969, Richard Nixon took the oath of office on the West front of the U.S. Capitol. A few blocks away, the Watergate West apartment building welcomed its first residents. “To go forward at all,” Nixon said in his Inaugural Address, “is to go forward together.” So many members of the incoming Republican administration were making the Watergate their home, the Washington Post quipped it appeared as if they were taking Nixon’s instructions literally. Rose Mary Woods, Nixon’s “confidential secretary,” rented a two-bedroom duplex on the seventh floor of Watergate East, with a “verbal” option to buy. She selected the apartment because it was an eight-minute drive from the White House. “I bring a lot of paperwork home on weekends,” she told the Post. “If friends stop by, I can leave all that work out upstairs in the den, and the downstairs won’t be disturbed.” Another Nixon secretary, Shelley Ann Scarney, ran into Elisabeth Hanford at a party in New York soon after the election. Hanford, who was working in the White House Office of Consumer Affairs and had been asked to stay on by the incoming administration, lived in Watergate East and recommended the building to Scarney, who called the leasing office and rented a one-bedroom apartment on the sixth floor. Her boyfriend, the president’s young speechwriter Pat Buchanan, rented an apartment nearby. Maurice Stans, the incoming secretary of commerce, paid $130,000 (nearly $920,000 in today’s dollars) for a Watergate East apartment on the twelfth floor. His wife, Kathy, installed yellow-and-white wallpaper in the foyer and hung her husband’s collection of African ceremonial knives in the master bedroom – on his side of the bed. In the library, with its grass-cloth wall coverings, seven-foot-tall elephant tusks joined a coffee table with an elephant-leg base and a rug made from a Bengal tiger shot by Maurice on one of his many international hunting expeditions. A combination den/TV room/room was turned into a “patriotic suite,” with blue carpeting, three white walls and one wall covered in red felt. “Isn’t it mad?” Kathy Stans giggled. Martha and John Mitchell, Nixon’s incoming Attorney General, purchased a duplex on the seventh floor of Watergate East, which came with four parking spaces. Martha said her new apartment lacked “the woman’s touch” and immediately began personalizing it. She replaced the parquet floor in the foyer with marble and brought in a “more traditional” stairway to replace the “contemporary one” that came with the apartment. Transportation Secretary John Wolpe and his wife, Jennie, brought a three-bedroom penthouse in Watergate East with two working fireplaces. Martin Anderson, and MIT-trained economist and special assistant to the president, and his wife, Annelise, who was finishing her Ph.D. at Columbia University, rented a one-bedroom apartment in Watergate West, with a view of the Howard Johnson Motor Lodge. Other Nixon appointees who moved into the Watergate included Postmaster General Winton M. Blount; the incoming U.S. chief of protocol Emil “Bus” Mosbacher, Jr.; Frank Shakespeare, chief of the U.S. Information Agency; H. Dale Grubb, a Nixon liaison to Congress; James Keogh, managing editor of presidential messages; Mary T. Brooks, director of the U.S. Mint. Sunday, June 18, 1972, began like any other Sunday at the Watergate, Maurice Stans later recalled. He slept in one additional hour, as he often did on weekends, and performed his morning exercise routine, which included about twenty minutes on his electric bicycle. He showered, put on a robe, and opened the front door of his apartment to pick up his copy of the Post. He went into the kitchen to fix breakfast. A headline on the front page caught his eye: FIVE HELD IN PLOT TO BUG DEMOCRATS' OFFICE HERE. Who in the world could have been up to that? He asked himself. As the scandal unfolded that summer and fall, Watergate residents turned on the evening news to see their home as the backdrop to a criminal investigation. Tourists gaped at the Watergate through glass-roofed buses and posed for pictures in front of the Watergate sign. Airline pilots approaching National Airport pointed out the Watergate to passengers, along with the Pentagon and the Lincoln Memorial. The New York Times published a map of “The Watergate Tour,” with stops at 2600 Virginia Avenue, home of the Democratic National Committee, and at Watergate Wine & Spirits for souvenir bottles of Watergate Scotch ($5.99 a bottle, or nearly $36 dollars today). Every four (or eight years), a new crop of presidential appointees arrives in Washington with high hopes. Like the new residents of the Watergate 50 years ago, they come to the nation’s capital hoping to “go forward together.” Many Trump appointees reportedly cluster near the city’s southern waterfront, in the Navy Yard and the Wharf, “a bubble within the Washington bubble,” far away from “official Washington” and the “buzzing” neighborhoods that aren’t “Trump-friendly.” They hang out in their friends’ apartments, at nearby restaurants or around rooftop pools. “It’s not, like, as ritzy as Georgetown,” one young Trump aide remarked. There was, of course, an iceberg ahead – the botched break-in at the Democratic National Committee in June 1972, and the cover-up that took down the Nixon presidency and forever redefined the Watergate in popular culture.